Buddy Guy is a blues immortal and a musical treasure loved the world over. He's been inducted into the Rock and Roll Hall of Fame, The Blues Hall of Fame, and earlier this year received a Lifetime Achievement Award from The Blues Foundation at the 2010 Blues Music Awards. Guy learned and helped shape many of the blues traditions that make the idiom the pillar of Western music that it is. He learned them, shaped them, defied them, and sometimes follows them such as the tradition of bluesmen to continue on even when they could safely rest on their laurels. Living Proof is Guy's latest album following the amazing career resurgence that began in 1991 with Damn Right I've Got The Blues. That record and those that followed have come close to being great but have always stops just short of being essential for one reason or another, a tradition that continues with Living Proof. A chunk of the album – "74 Years Young," "Thank Me Someday" — was written to function as an audiobook, Guy's life story put to music. He has no doubt lived an amazing life and been a part of music history but the songs can't help but disappoint because they don't convey the emotional impact of those experiences but feel more like narrated passages from Guy's Wikipedia entry. The highs, lows, hardships, and triumphs don't shine through in the lyrics. "74 Years Young" opens with an acoustic folk-blues figure with Guy singing of being a youthful septuagenarian, a senior citizen by law but a man with plenty of life left in him. To underscore that point, he injects the song with vitality in the form of an eardrum-assaulting guitar solo. Age has not dimmed his ability as a lead guitarist nor has it caused him to mellow in his attack. Longtime fans of the man and his guitar will take heart in that, although this particular song is not well served by it. Guy has always been an over-the-top performer and his guitar licks have always been larger than life but they overwhelm the easy rollick to the detriment of the song. In addition to the biographical pieces on the record, Guy is also looking ahead and contemplating mortality on songs like "Living Proof," "Everybody's Got To Go," and "Stay Around A Little Longer." Guy's guitar isn't the only component of his music not dulled by age. He can still deliver that roaring, piercing vocal and on the title track he funnels that energy into a spirited, spiritual, sanctified gospel sermon. Guy testifies vocally and with his guitar with supernatural force. On "Everybody's Got To Go," he continues that same theme and contemplates mortality but where "Living Proof" is fire and brimstone, "EGTG" is a quieter, more contemplative affair. 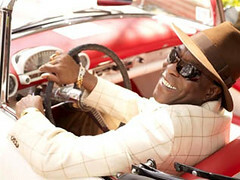 BB King and Buddy Guy are two of the last big name bluesman who can trace their careers to the golden age of the blues. They've toured together and recorded together before but "Stay Around A Little Longer" is something special. Two friends of great ability and accomplishment give thanks for the longevity they've enjoyed, a longevity too many of their contemporaries were denied. The lyrics mine some clichés and the dialog at song's end could make some listeners cringe but there is genuine warmth emanating from these two giants that saves the song and gives it some heart. Not everything fits neatly into a theme. Buddy Guy is still a preeminent blues player and there are a few songs on the record where he does just that. "Key Don't Fit" is generic blues fare and it's a euphemism for exactly what you think it is but this is the kind of material Guy has dominated for 50 years and he rips into this one with the vitality of a man half his age. He still sounds as convincing today as he ever has. It's not time for him to age gracefully or get reflective. He can still deliver the traditional Chicago blues at full force and volume. It may seem unbecoming for a man his age to be singing about chasing tail but that's only if you think about it. Don't think- just listen to him howl and wail. 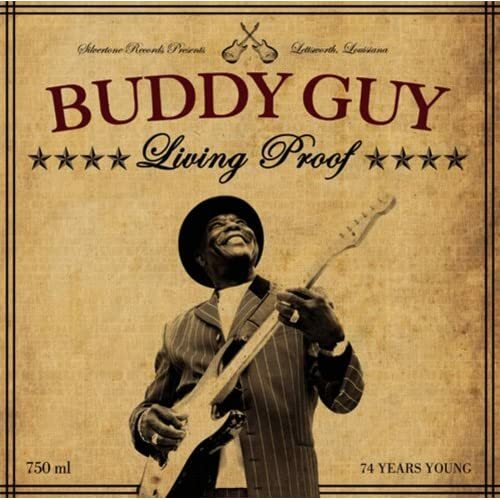 Most of what I love about Buddy Guy is found on Living Proof, flaws in the delivery and presentation aside. He still sounds engaged, enthused, and invested. It's a shame the material doesn't provide a stronger foundation. This is a good record by a great man. For devoted fans, that will be enough even if they wish it could have been something more.